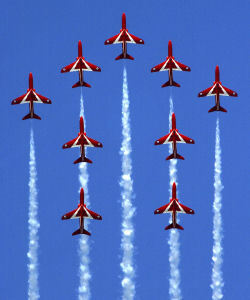 I’m not sure whether the head-rush was caused by the Red Arrows at Airbourne (which started here yesterday on Eastbourne sea front) or news that we’ve been short-listed for Tourism South East’s Bed & Breakfast/Guest Accommodation of the Year 2010 award. We’ve an assessor coming to have a look around so the kayak might have to be shifted from the lobby and maybe, on a purely temporary basis, the shorts and old-school Birkenstocks will have to be replaced by nattier threads. Maybe.